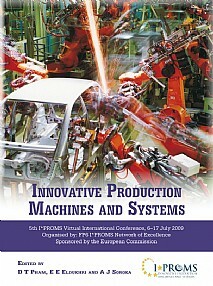 IPROMS 2009 is the fifth in the successful series of online, web-based conferences on Innovative Production Machines and Systems organised by the EU-funded I*PROMS Network of Excellence. It continues to build on the themes of the previous conferences, and attracted over 200 authors from some 20 countries across five continents. There were 6000 registered delegates and guests from 110 countries participated, making it a truly global phenomenon. While providing a timely overview of manufacturing developments, the volume focuses particularly on intelligent engineering and robotics, and also the growing interest expressed in bees algorithms. This volume of almost 70 papers provides an invaluable state of the technology review and assessment, enabling engineers and applied scientists to appreciate developments and potential in a number of exciting and emerging fields. It is a focal point for access to information from researchers and industrial practitioners in the field of intelligent systems and soft computing techniques and their application in diverse areas within manufacturing. This volume provides a timely insight into the subject for engineers and applied scientists in the field of manufacturing, manufacturing technology, robotics, product automation and control, nanotechnology and micro-manufacture. It also provides leading edge data for researchers in these subjects.